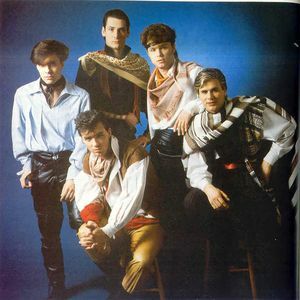 Spandau Ballet /ˈspændaʊ ˈbæl.eɪ/ are an English band formed in London in 1979. The band were inspired by, and an integral part of, the electro movement. They became one of the most successful groups to emerge during the New Romantic era. The band's classic line-up features brothers Gary Kemp and Martin Kemp on guitars, vocalist Tony Hadley, saxophonist Steve Norman, and drummer John Keeble. The group's debut single "To Cut a Long Story Short", which reached No. 5 in the UK in 1980, was the first of ten UK top 10 hits, including a No. 1 single "True", a No. 2 single "Gold", and two No. 3 singles: "Chant No. 1" and "Only When You Leave". The band have had eight UK top 10 albums, including three "greatest hits" compilations and an album of re-recorded material. At the height of their popularity in 1984, they received the Brit Award for technical excellence. The band split in 1990 and the members pursued solo careers, with both Kemp brothers winning acting roles. Since their reformation in 2009, the band have been recognised at the Q Awards and Gary Kemp's songwriting has been honoured by the Ivor Novello Awards.